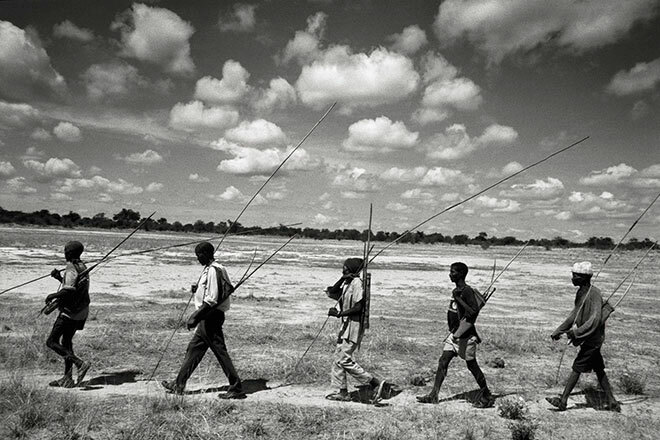 San hunters set off from their village on a hunting expedition. They are armed with bows, poisoned arrows and flexible poles used to hunt hares. 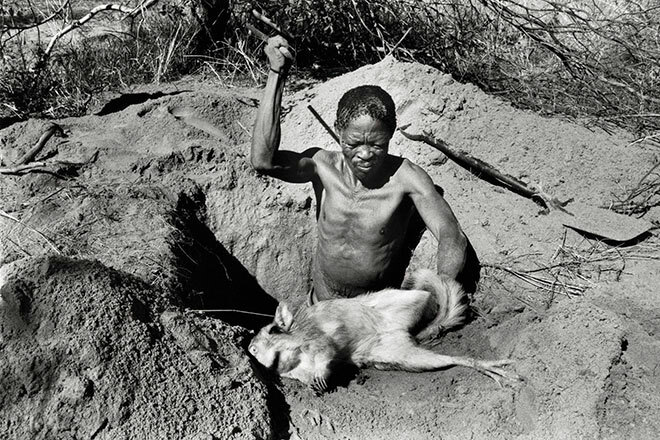 This photo essay, about the so-called “Bushmen” of Namibia and South Africa, won first prize for Nature Stories in the World Press Awards 1997. Across southern Africa the traditional lifestyle of hunter-gatherers, known as San people, is on the edge of extinction. A few communities, however, continue their attempts to be self-sufficient, supplementing whatever the land yields with a little cattle farming. 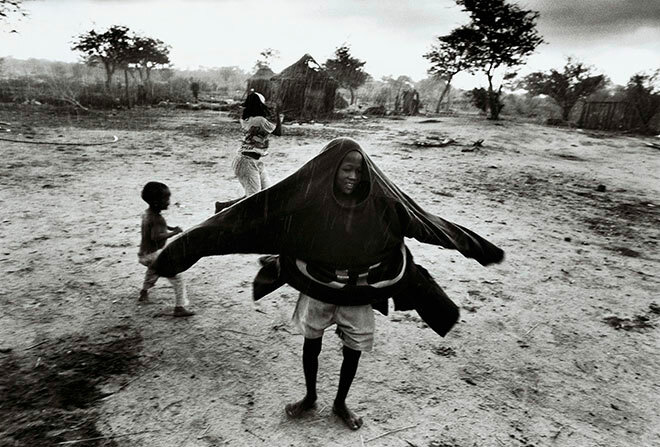 Most of these images come from a single community in the village of Makuri, Namibia, where some connection to traditional practices has been retained. One, however, was taken at a resort in South Africa’s Cederburg mountains, where a community of San had been imported from the borders of the Kalahari Gemsbok Park, to set up a “Bushman village” especially for tourists. Another was taken at a diorama display in Cape Town, which has since been controversially removed. Southern Africa’s San are one of the fourteen known extant “ancestral population clusters” from which all modern humans descend. For the majority of these communities today, problems of discrimination and alcoholism are rife as they try to find ways to exist within the modern societies that have engulfed them. Old Kaece, a San hunter, clubs a captured hare to death near Makuri village. 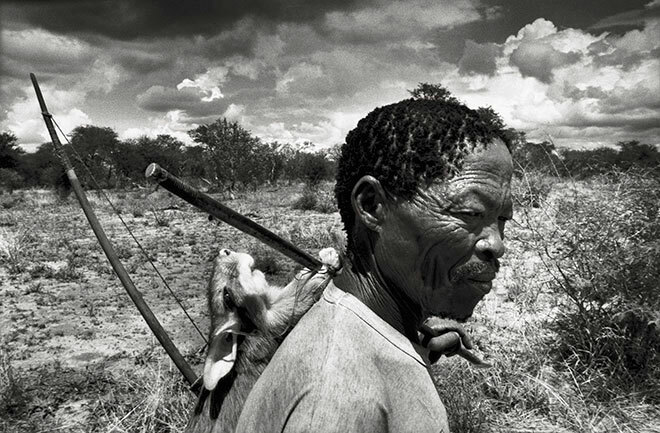 Old Kaece carries a springhare back to his village of Makuri. He is one of the few San people to retain traditional hunting skills. 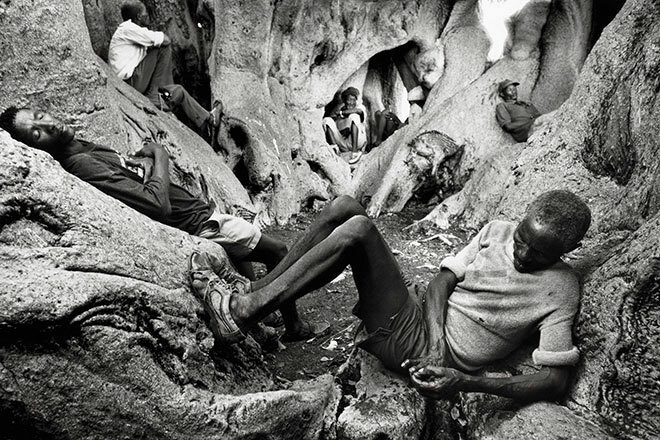 San hunters rest in the folds of a massive baobab tree after an unsuccessful hunt. 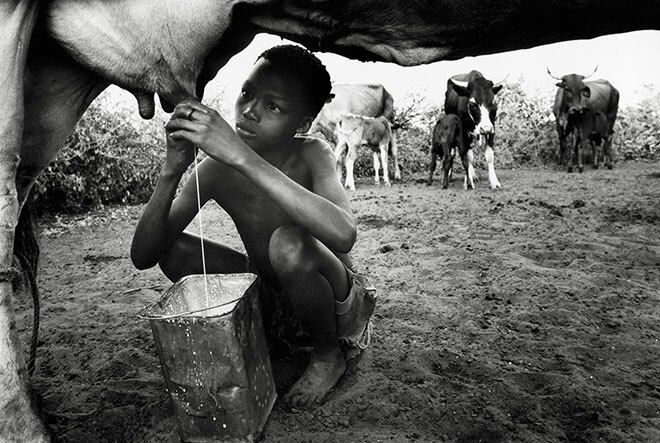 A young boy milks a cow in his village. Organizations are working with local San settlements to help them develop animal husbandry and other self-supporting methods. 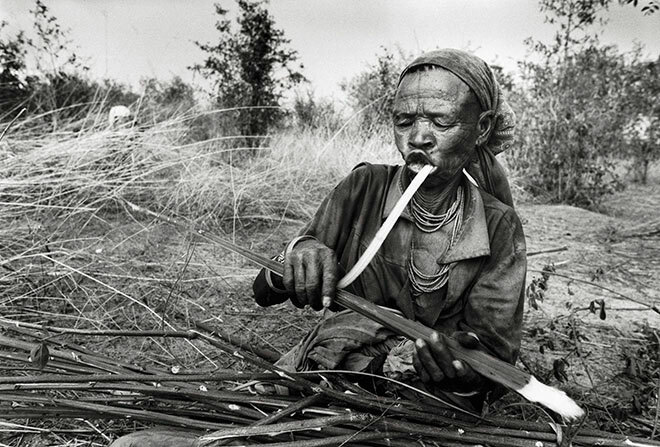 An old woman uses her teeth to strip bark from a reed, which she will use to tie up saplings for the construction of a hut. 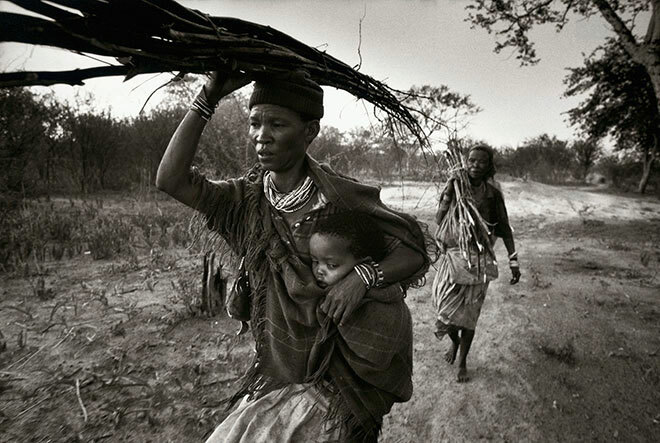 San women return home carrying saplings, which will be used to build a hut. They are hurrying to avoid the oncoming rain. San children stand in the rain, enjoying its thick droplets after a long dry spell. 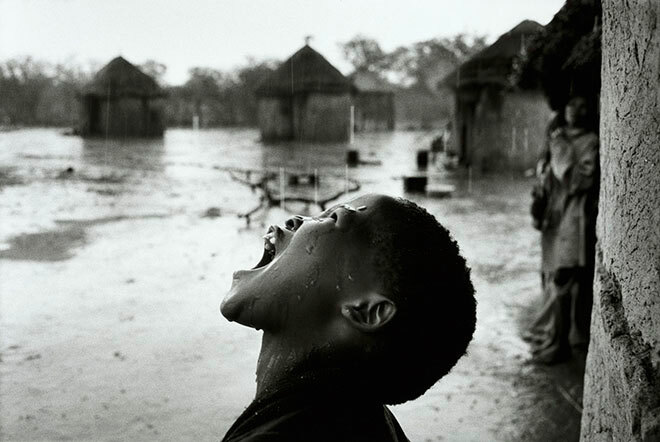 A child rejoices in the arrival of the long-awaited summer rains. They were the heaviest in the region for 20 years. 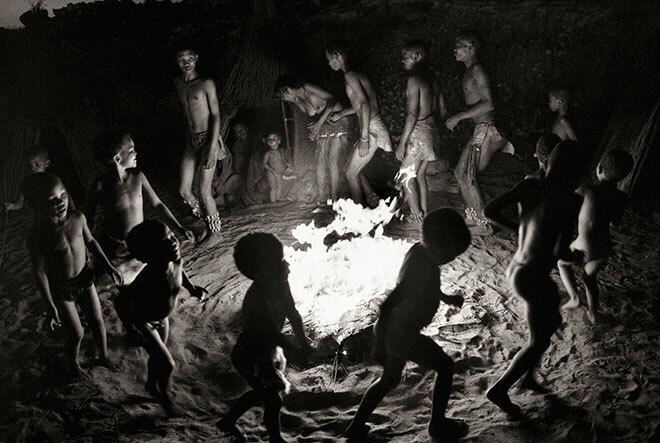 San people perform a traditional circle dance around a fire in their village of Kagga Kamma. This village had been set up at a resort for tourists to experience “Bushman” culture in the Cederburg mountains. 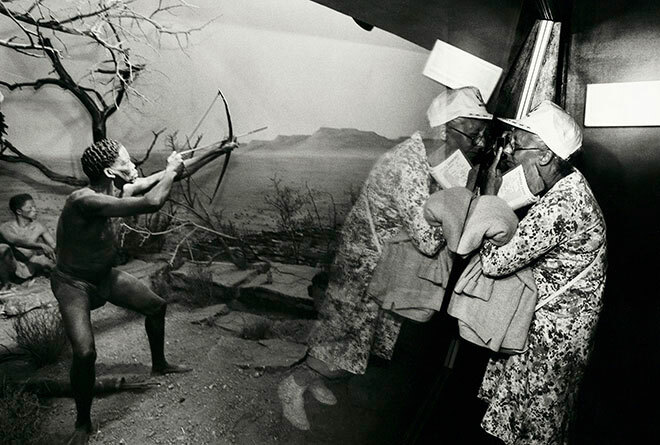 A visitor studies a “Bushmen” diorama at Cape Town’s South African museum. This diorama had been on display since 1960 and was by far the museum’s most popular exhibit, yet it was controversially closed in 2001. Critics of the diorama suggested that the San were being portrayed as a form of wildlife in an expression of apartheid ideology, while defenders felt that it gave recognition to the San’s way of life, as the “first people” of South Africa.